Controlling your environmental temperature is about more than comfort. It can enhance employee productivity. Make customers feel more satisfied. And increase the lifespan of your goods and equipment. Bradley Refrigeration air conditioning solutions deliver maximum efficiency and reliability – so your A/C can be a real growth driver for your business. We provide complete air conditioning solutions for retail and commercial business throughout the UK. Our customers include shops, warehouses, factories, restaurants, cafes, bars and many more. It doesn’t matter how big or small your space is. We offer a wide range of products, from single-system heating and cooling to large VRV systems. And with 50 years of experience, we can configure your solution for maximum efficiency. With our cost-effective maintenance plans, you’ll stay in full control of your environment year after year. By keeping your A/C solution in peak condition – at an affordable cost – you can also greatly reduce total cost of ownership. You may have taken great care getting the right look for your retail or commercial space. Don’t let ugly air-con spoil it. We can provide systems in a wide range of finishes, so your new A/C installation blends right in. Air conditioning is often a business-critical system. That’s why we offer a fast, 24-hour call-out service. Your Bradley engineer is always here for you – so if your A/C does develop an issue, the cost is minimised. 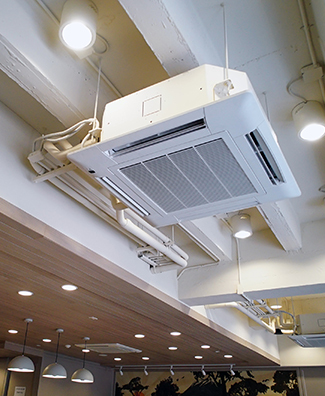 Find out more about how we can meet your retail and commercial air conditioning needs. Call our team in Sheffield on 0114 236 9971, or email us. We can usually provide a free site survey and quote.